Curl up with a warm mug of quotations from classic authors. Imagine being able to curl up with a warm drink and the words of your favorite author, no matter where you are. These charming stoneware mugs are covered in quotes and phrases from iconic writers, like little sips of the world's great books. There's Jane Austen, for those who are steeped in the complexities of human relationships. If you're dreaming of adventure, try drinking from the purple prose of the Bronte Sisters. The whimsey of Lewis Carroll can transform the most hectic day into a madcap tea party. And if your workday has taken a dark turn, well, Edgar Allen Poe can keep you company. 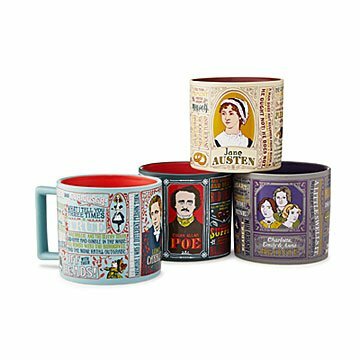 Whatever your literary taste, these mugs provide the perfect punctuation to your early morning, coffee break, or winding down routine. Made in China. My sister has used the mug several times already and never has a problem! Not only is the product great but the packaging is witty and there are small details on the mug that make you smile, in addition to the literary quotes. It is a mug that mostly gets used as a mug. You know, to hold liquids and such. This mug is ample size for drinking your favorite hot beverage out of. I gave this as a gift and filled it with my friend's favorite sweets. It made for a very colorful gift and it is so fitting for her because she loves Poe and will appreciate the various Poe quotes that are written on the mug! I bought this as a gift but I wish I got a second one to keep for myself! Great sized mug. The design is wonderful for any literature or Poe lover.